Prescribed fire helps reduce the possibility of dangerous wildfire while enhancing land’s environmental quality. PALATKA, Fla., Feb. 7, 2019 — The St. Johns River Water Management District is conducting a 174-acre prescribed burn Thursday at the Lake George Conservation Area within a half mile of Lake George, between Middle and Bar roads in Volusia County. The purpose of the burn is to reduce hazardous fuel loads and improve natural habitat. 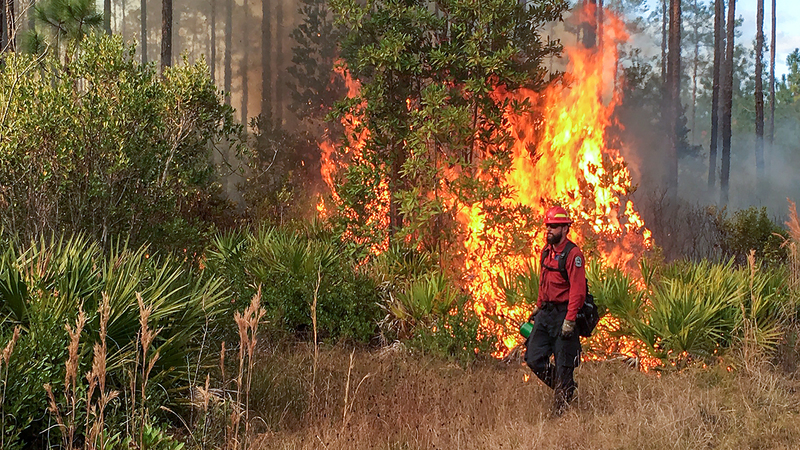 Prescribed fire is the use of carefully planned fire purposefully set under stringent conditions to control the fire’s effects. Its benefits include restoring and maintaining natural communities, reducing chances of destructive wildfires, perpetuating fire-adapted plants and animals, cycling nutrients, controlling tree diseases, and opening scenic vistas. Prescribed fires help prevent wildfires by burning off fuels that naturally build up over time, while also helping to control the growth of woody shrubs. Before conducting a burn, the district ensures wind and other weather conditions are correct for managing the fire and minimizing the impacts of smoke to residents and traffic.